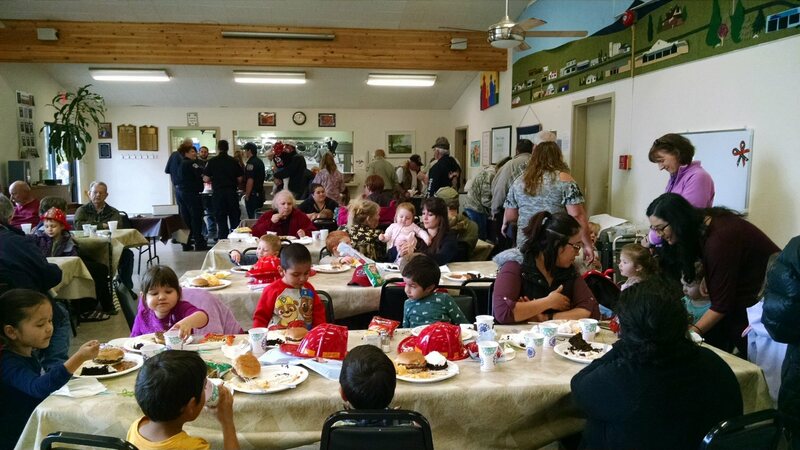 Celebrating “The Week of the Young Child,” First Five Shasta and Bright Futures hosted a wonderful “Lunch with Community Helpers” at the Intermountain Community Center in Burney beginning at 11 a.m. on Wednesday, April 18. According to Bright Futures Family Advocate Shaylene Herndon, 89 children and 62 adults attended and had an opportunity to meet community helpers from the Burney Fire Protection District, Shasta County Sheriff’s Department, CalFire, California Highway Patrol, the US Forest Service, Burney Disposal, and Dr. Patterson from Eye Care Associates. The program was fun and educational. Each agency gave a brief explanation of the work that they do in terms that the young children could enjoy and understand. Afterwards, everybody shared a delicious lunch including barbecued burgers, potato salad, baked beans, au gratin potatoes and cake provided by Diane Murphy and her crew at Shasta Senior Nutrition Center. Burney Fire Chief Monty Keady pitched in to help barbecue and serve the burgers.